A fibroadenoma is a very common benign (non-cancerous) breast condition. In a fibroadenoma, there is overgrowth of the tissue that supports the breast and overgrowth of the cells lining the milk ducts in the breast. Fibroadenomas have been reported in up to 9% of the female population. They are most common in young women, occurring mostly in the 21-25 year age group. Fewer than 5% occur in women over age 50. Fibroadenomas respond to hormonal changes, and vary during the menstrual cycle and during pregnancy. Their cause is unknown. Sometimes fibroadenomas appear for the first time or grow in post-menopausal women taking hormone replacement therapy. Fibroadenomas may form a lump that can be detected by a doctor or patient, or they may be found on a mammogram or a breast ultrasound that is done for another reason. In 80% of cases there is a single fibroadenoma. Occasionally, there can be many scattered throughout the breasts. Fibroadenomas can vary in size from a few millimetres to five or more centimetres in diameter. They can be tender, particularly prior to a period. When a fibroadenoma can be felt as a lump, the lump is usually oval or round, smooth, firm, and moves very freely. Fibroadenomas have been referred to as “breast mice” as their ability to move so freely gives the feeling that they are running away from the examining hand. While fibroadenomas may show up on a mammogram, they are often seen more clearly on an ultrasound of the breast. The diagnosis of a fibroadenoma can be confirmed by taking a sample of cells from the area for a pathologist to examine under the microscope. This can be done with a fine needle biopsy or a core biopsy, often under the guidance of ultrasound. It is sometimes difficult to tell the difference between fibroadenomas and other benign breast lumps on fine needle or core biopsy. In some cases, fibroadenomas may show very active or “atypical” cells on a biopsy. Fibroadenomas with atypical cells will usually need to be removed surgically and examined. Small lesions that look like fibroadenomas on ultrasound may not require biopsy. These may be followed up with an ultrasound scan instead. Fibroadenomas are sensitive to hormonal change. They frequently vary during the menstrual cycle, often becoming more prominent and more tender prior to a period. Fibroadenomas can become larger during pregnancy and while breastfeeding. They do not usually interfere with a woman’s ability to breastfeed. It is estimated that approximately one third of fibroadenomas, if left alone, will decrease in size or even disappear completely. A further one third will increase in size, with the rest staying the same. 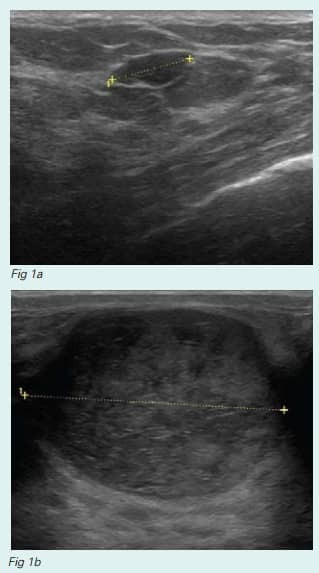 Breast ultrasound images showing a small (1cm) fibroadenoma (Fig 1a) and a large (3cm) fibroadenoma (Fig 1b). Fibroadenomas that are larger than 3 cm in size, are painful, are increasing in size, or show concerning features on imaging or biopsy, will usually be removed surgically. Fibroadenomas can often be managed without surgery, especially in younger women. A fibroadenoma that is not removed surgically is usually monitored for a period of time. Fibroadenomas are not cancerous, and having one does not significantly increase the risk of developing breast cancer. Fibroadenomas contain some normal breast tissue cells, and these cells can develop cancer, like all the cells in the breast. The chance of cancer developing within a fibroadenoma is no higher than the chances of cancer developing elsewhere in the breast.